A curious new route began on 27 April 2002, following a decidedly indirect route between Tower Gateway and Covent Garden via the South Bank. 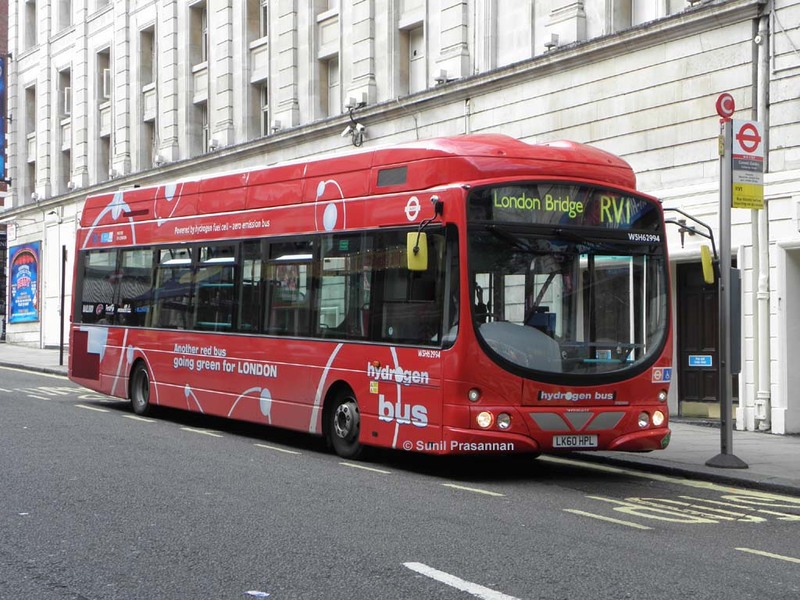 Surprisingly, despite TfL's dislike for letters in route numbers, it was dubbed RV1, doubtless for Riverside as shown on the side of the bus, and awarded to First Capital using new Mercedes Citaro full-size single deckers. The route is clearly aimed at tourists, and the original buses had depictions of the various attractions served along the way, including the Tower and London Eye. Buses run every 10 minutes all day every day of the week, which is unusual – most routes run less frequently during the evenings and on Sundays. The use of full sized single deckers, rather than Dart sized buses, is also unusual for London. Having said that, the Citaros were suddenly whisked away during 2010 without explanation, and nearly new "bog standard" Enviro200Darts replaced them. Between 2004 and 2006 the route was host to three experimental hydrogen "fuel cell" vehicles. These use hydrogen and oxygen to produce water and electricity – the reverse of electrolysis – the electricity being used to power the vehicle. Although hydrogen production and storage raises challenging questions, if technical and cost issues can be cracked then the technology provides an ideal solution for clean urban transport. Following completion of the trial, the vehicles were decomissioned and the components returned to manufacturers for further research. However TfL decided to order a fleet of hydrogen powered buses for further trials on the RV1. Initially there were to be five fuel cell vehicles and five with internal combustion engines, but the latter order was cancelled and replaced by three further fuel cell vehicles. The vehicles are a different type from the initial trial, being VDL SB200/Wright Pulsar. WSH62994 (LK60 HPL) stands at the Covent Garden terminus in Catherine Street, with the Novello Theatre in the background, on 3 September 2011. 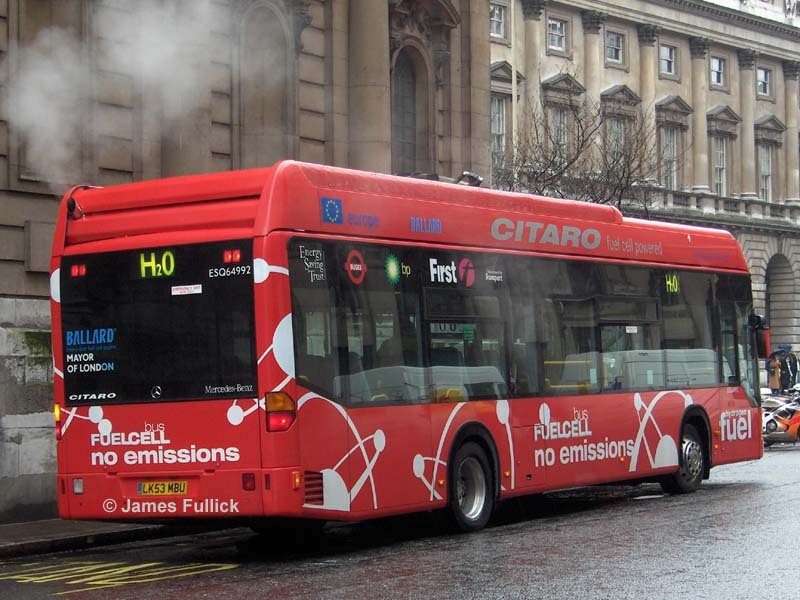 The "zero emission bus" claim on the side of the bus is clearly spurious, but what can be said is that the emissions are clean, being pure steam. There are 8 hydrogen buses for a PVR of 8, so they are supported by Caetano Nimbus bodied standard Dart SLFs. I do not normally deliberately include obsolete vehicle types, but I have included an earlier photo of one of the trial vehicles as of historical interest. Providing a typically atmospheric view is ESQ64992 at Covent Garden again on 22 February 2006, showing off its "demonstration" blind displays. The bus is labelled with many of the organisations taking part in this research & development trial; London was one of ten European cities which received 3 of these vehicles each. The buses initially ran on route 25 as extras, then transferred to the RV1 where they formed part of the service, albeit only being able to operate for part of the day due to limited fuel range; they were swapped with conventional buses during the day. The new buses are able to complete a full day's mileage, though have had to be stood down from time to time such as during the Olympics due to security issues around the fuelling site. To facilitate the trials the route has been removed from the tendering programme, having already completed the original seven year term, extended from 5 years. A new negotiated (i.e. non-tendered) contract began in 2010.